One of the great cities in Rajasthan, India is Jaipur. 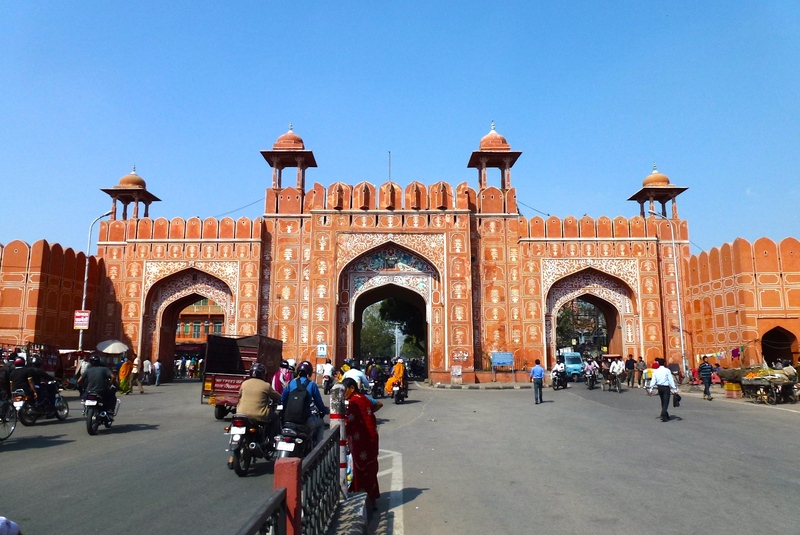 It is known as the “pink city” due to the color of the buildings as well as the walls and city gates surrounding the central area. 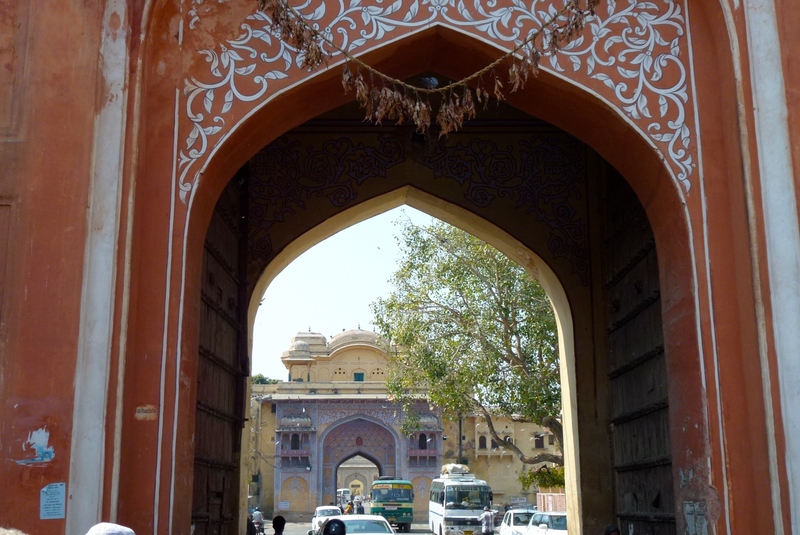 Ajmeri Gate, leading into central Jaipur. The color of the gates and walls, as well as buildings in the central area give the city its nickname. Jaipur is one of the most visited cities in India since it is not too far from New Delhi and Agra (home of the Taj Mahal), and forms a triangle of tourist destinations with these two other cities. 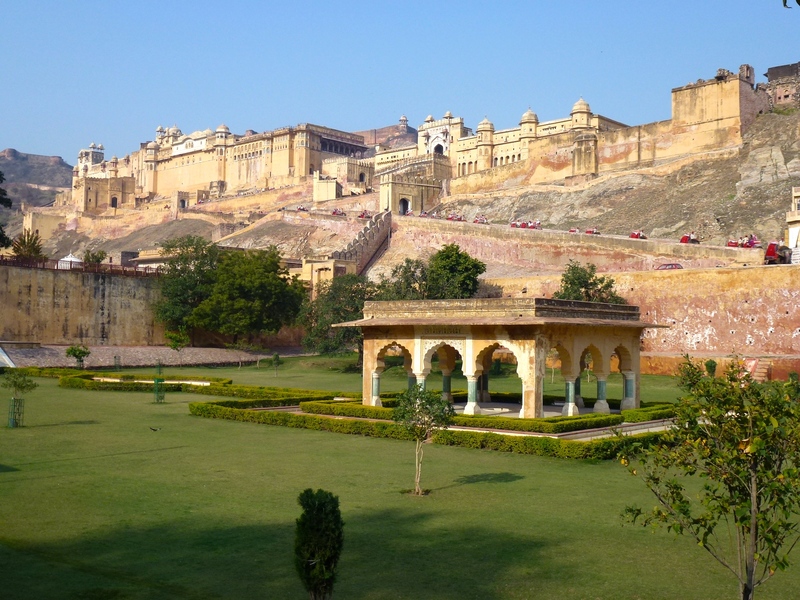 While there is a lot to see in Jaipur itself, there’s no question that the tourist sight is Amber Fort, located about 7 miles (11 km) north of town. 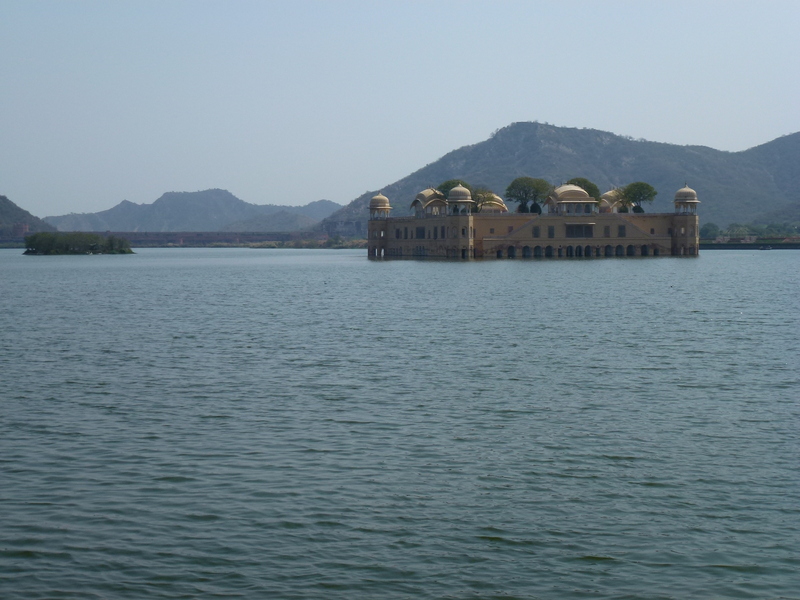 The Jal Mahal (Water Palace) on Man Sagar Lake was used for royal duck shooting parties in the mid 18th century. Leaving Jaipur, you wind past Man Sagar Lake and through the mountains for a short distance until all-of-a-sudden it appears sitting on a hill to your left. The golden-hued fort looks like a movie set rather than an actual historical palace. The fort is the former capital of Jaipur State and is the one sight that cannot be overlooked when visiting Jaipur. A view of Amber Fort. If you look closely, you can see the elephants with their red coverings making their way up to the gate. The highly decorated Ganesh Pol, a three story gate connecting the outer courtyard to the private apartments. Construction began in 1592 on the current fortress, built on the remains of an earlier (11th century) fort. Amber Fort is divided into 4 main sections, and each is a bit unique in its architecture. 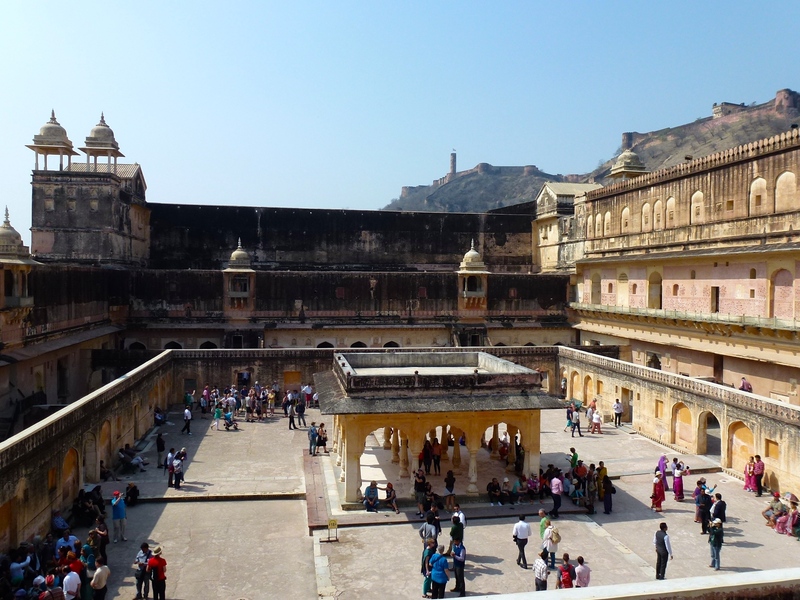 The courtyard of the Palace of the Raja Man Singh, one of the four main sections of the Amber Fort. You have to be patient and wander around a bit to see it all. We hired a guide and he pointed out some interesting things. After we finished the tour, we wandered around on our own, and found other great views. 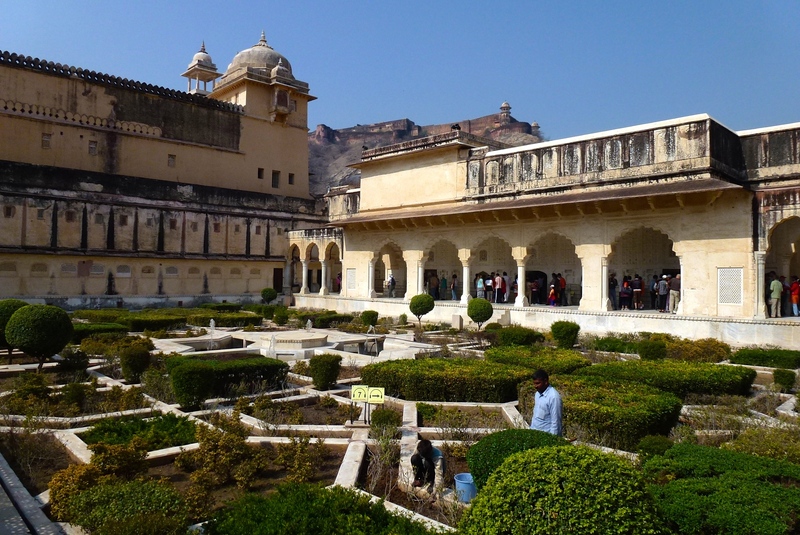 Another beautiful courtyard in Amber Fort (Jaigarh Fort is in the distance on the hill). There are three main ways up to the fort – by foot, jeep or elephant. Of course most tourists take the elephant ride, and so did we. The elephant can take two passengers at a time. Given the popularity of the elephant transportation, expect a wait of 20 – 30 minutes in line. Although this is definitely doing the touristy thing, it’s a once in a lifetime experience and was fun. By Indian standards, it’s not cheap – 900 rupees or about $15, a small local fortune. 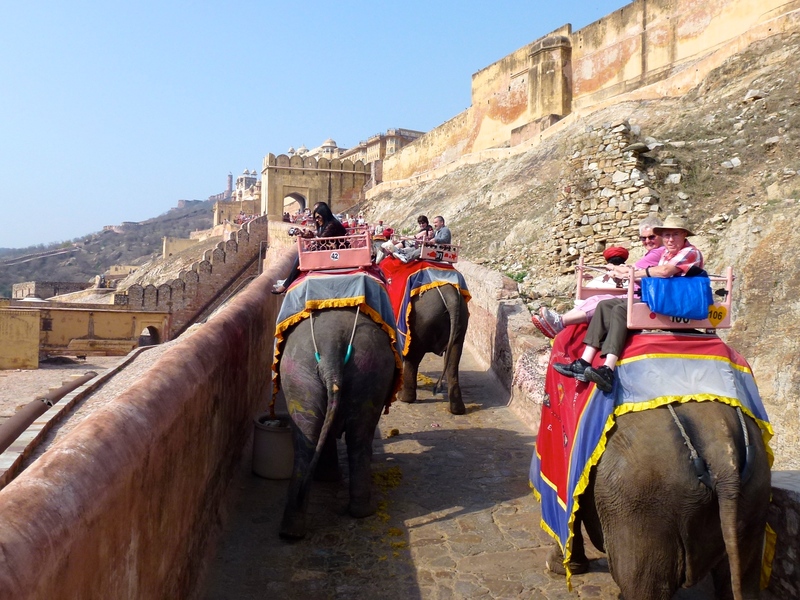 The elephants and tourists make their way up to the Amber Fort. There is another, older fort (Jaigarh) above the Amber fort, but time did not allow for us to hike up there (about 1 km uphill from the Amber Fort). 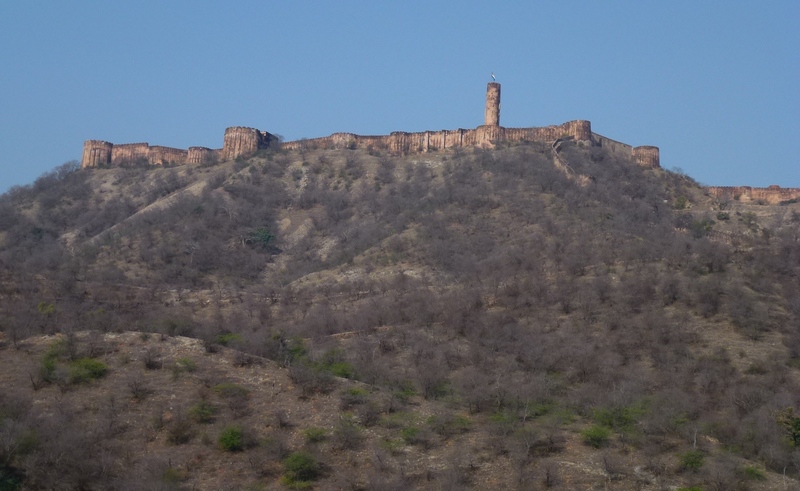 Jaigarh Fort, which sits above Amber Fort. 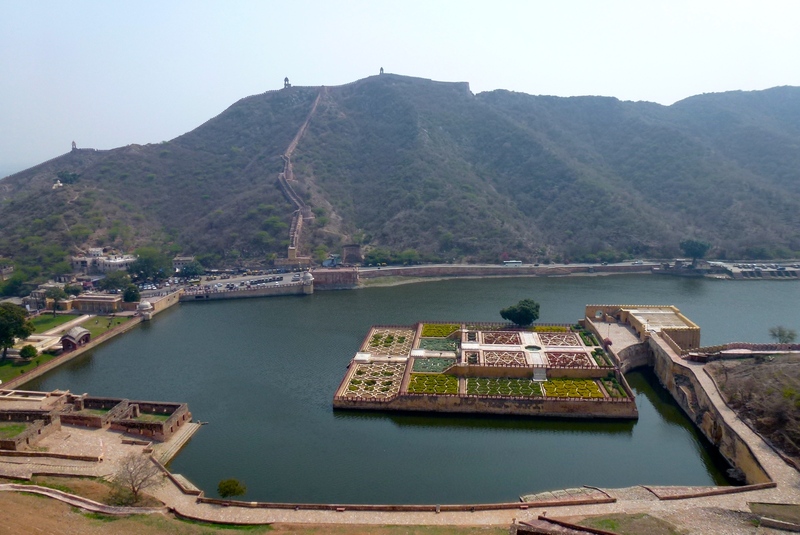 The view from Amber Fort is astounding with mountains, huge walls snaking around the hillsides, as well as seeing Maota Lake below. Looking down on Maota Lake, with the gardens of Kesar Kyari Bagh. The lake provided water for the fort. The walls protecting the region can be seen in the distance. 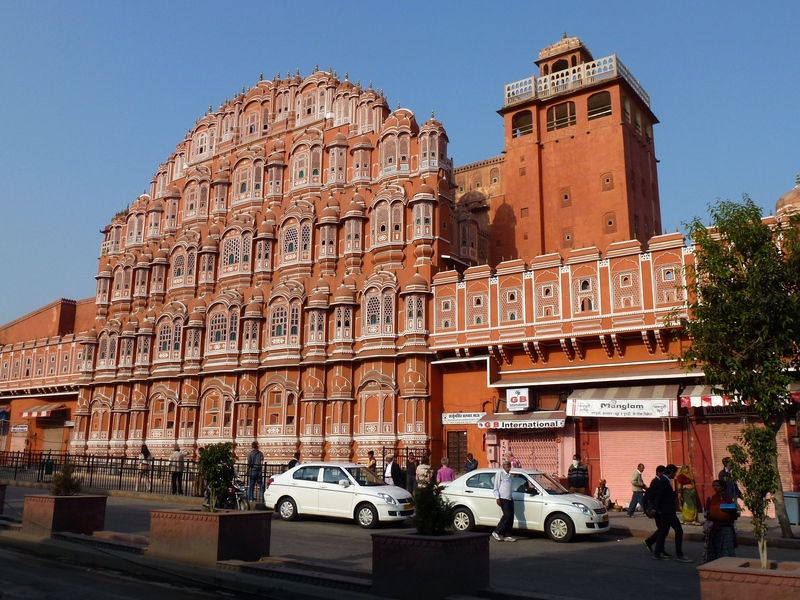 With its pink façade, the Hawa Mahal is the photogenic centerpiece of Jaipur. It is unusual in that it is five stories high but only one room in width. Its purpose was to allow the veiled ladies of the harem to view city life unnoticed from the streets below. It was built in 1799. The Hawa Mahal in Jaipur. Right next to the Hawa Mahal, this Palace was built in the early 18th century, and is now a museum with paintings and manuscripts. 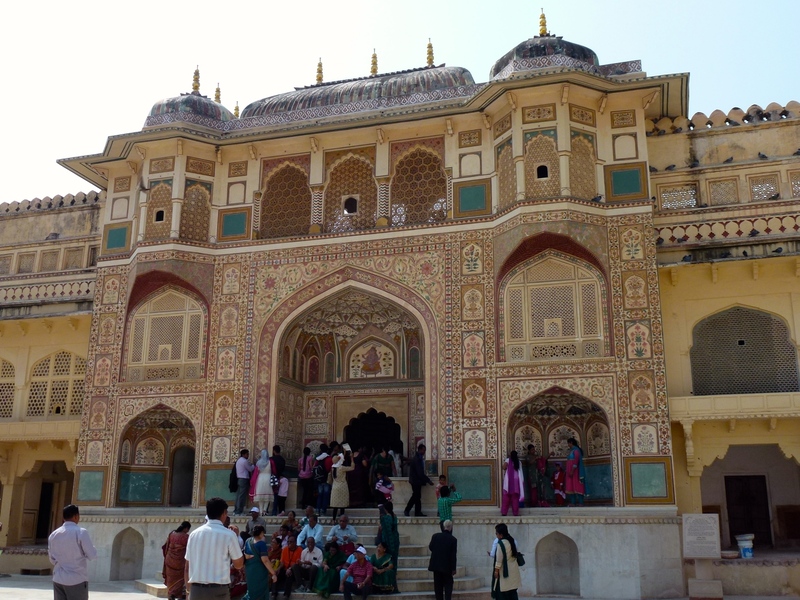 Since we had just visited Amber Fort, we did not take the time to visit this Palace. City Palace lies straight ahead through this gate. Jaipur is also known as shopping mecca for jewelry and precious and semi precious gemstones. There are a lot of jewelry and gem shops just outside the main walls. Bring your money and shopping list! We also walked around the heart of the city – busy area which is organized by crafts in sections. Just a teeming mass of shops, workers and every day life going on. 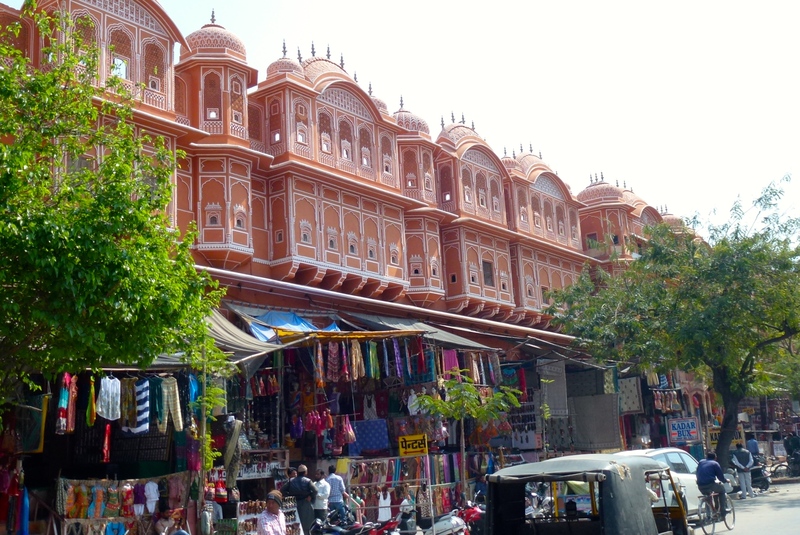 Rows of shops in the central district of Jaipur. Posted in India and tagged Amber Fort in Jaipur, India, India Travel, Places to see in India, Things to see in Jaipur on February 8, 2015 by Paul Terry.